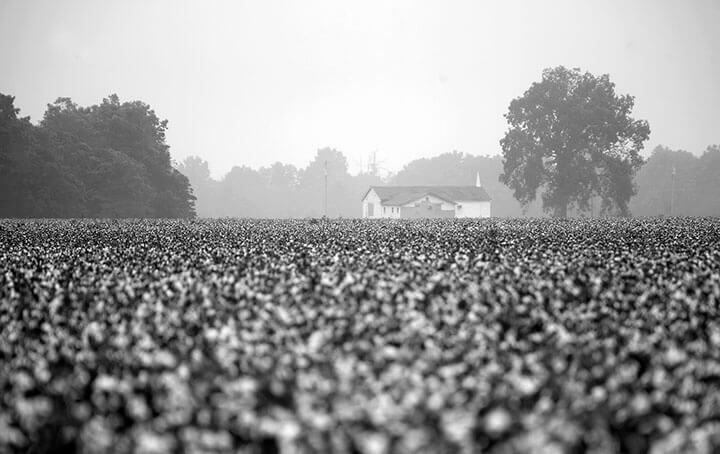 A cotton field in Mississippi. Photos by author. Gram was originally from Spartanburg, South Carolina, not too far from Aiken. My great-grandma Marie Aiken never talked about her upbringing, but their name, “Aiken,” and roots made me think they were enslaved. As a Northerner, when I ventured to Mississippi to accept a teaching position in 2012, I saw cotton for the first time and began to wonder about my Black family. This photographic journey began because I wanted to connect with my Black side, the Black women of my grandmother’s generation. I began to interview and photograph grandmothers in Mississippi, my new home state. These Delta grandmothers are matriarchs to their families, like my grandmother. They are ordinary women, like Gram, who have lived extraordinary lives under the harshest conditions of the Jim Crow era and were on the front lines of the civil rights movement. They are church women. I needed help finding the women who would help me find memories of my grandmother and honor her. I asked Clarksdale mayor Bill Luckett, a White man. Bill e-mailed me five names. I called one, Rev. Juan Self, who lives in Memphis but preaches in Clarksdale, Mississippi. He agreed to meet me and listen to my idea. When he approved of me, he called another pastor, who then called another pastor. In the end I had 19 pastors helping me. I interviewed 54 African-American church women elders, drove 6,000 miles, collected over 240 hours of raw audio, and took around 7,000 photographs. Here are two stories. Was married to slain civil rights leader Medgar Evers for 12 years. My mother and father were married. She was very young, almost 17. My dad was about five years her senior. My grandmother felt that this gift, meaning me, the child, should have the best life that could possibly be given to her. She thought my mother was too young to really do the best job in rearing me. I was born in 1933. That was a time when the elder women in a family felt free to take the infants home with them and rear them if they felt that they would not get what was needed at home. So, that’s what my grandmother, Annie Beasley, did. She walked across the street, to my mother and my father’s home, and I’m told that she said, “This baby needs me. Wrap her up, Mildred. I’m taking her home.” Home was just across the street from my mother. They lived on the same street, but on opposite sides. And perhaps my mother was so young, and what my grandmother was about to do was something that was acceptable in our neighborhood, and she knew she could see me and be with me and whatnot, but you usually gave in to what the elders wished. So, I was packed up, taken across the street. My grandmother decided that she had to retire from her job, she was a schoolteacher, and devote her entire attention to this precious child that had been given to this family. That’s the beginning of my being Mrs. Beasley’s granddaughter, rather than Mildred’s daughter. Prayer was always important in life. I had to pray every night. She sat there next to me as I knelt at the bed. And I can recall sometimes she would do this hum [she hums the tune] and she’d go into that, “Baby. Come on. It’s time to say your prayers.” [And I would say] “Oh my goodness, I don’t want to say my prayers. Do I have to say my prayers tonight?” But I wouldn’t dare say that to her. Obediently I would turn and kneel down next to the bed and always say the Lord’s Prayer and always ask for blessings for those who had less than I. And I would jump up as a child would do. Okay I’ve said my prayers. She’d always wait until I almost got out of the door, out of the bedroom door. “Baby.” And I knew what she was gonna say. “Come back. You didn’t finish your prayers.” “Yes, mama. What didn’t I do?” “You know what you did not say. You get on your knees and you ask God to make you a blessing.” To this day, a day doesn’t pass that I don’t ask God to make me a blessing. I didn’t understand it then, but you live and you learn and if I say nothing else in terms of prayer, I ask that—make me a blessing. It’s a miracle what grandmothers and older nurturers can do for you in training. And she never ventured from telling me that I had special talents, and that she and God expected me to use them in the right way. How blessed I was, you know, and I’ve lived by those teachings over years and honestly, I believe it has been the only way I have survived through everything that I have been through. If that were to be taken away from me, I don’t know who I would be, I don’t know what I would do, so I choose not to venture into that but to just be thankful for her and all that she gave to me. My paternal grandmother was a housekeeper to a White family. She brought home every Thursday, she would bring home the leftover food from this White family’s home. And she was a superb cook, but I was introduced to things like strawberry tarts, cookies with chocolate frosting, chicken prepared in a different way, other than the boiled or the fried. And she would bring home the young girl, in this White family, she would bring home her clothes for me. And all of the women in my family were great seamstresses. And I remember my [other] grandmother, Annie, and my aunt, Myrlie, taking those clothes and ripping them apart and sizing to fit me because they were too large. I had my first full length mink coat by the time I was 13 years old. My take—“What is this? What is this fur? I don’t want this.” And my aunt Myrlie said, “Baby sister,” which was my nickname, “Don’t you know what this is?” “No, I don’t know what it is.” So, she went on to explain it to me, about the mink coat and what it meant society-wise, you know, it’s upper-echelon. [She said] “You can wear this.” Interesting enough, I have a photograph of myself in that mink coat that Medgar took of me when I was pregnant with our first child. But I’d reached a point that I was weary of wearing that girl’s clothes. And I said to my aunt, my mother, and my grandmother, Annie, I said I want my own clothes. They said, “Well baby, we don’t have the money to get you clothes like that.” And I said, “I don’t care. I want my own.” My grandmother took it upon herself to take a croker sack and make skirts out of it. We called it broomstick skirts. A broomstick skirt is one that has a band around the waist and you take the other cloth, the long part of the skirt and you gather it on this band, pin it and that’s it. The cloth came from the flour sacks. You’d go to the store and you would buy RIT dye and you would dye those croker sacks different colors and cut it and make yourself skirts. I preferred that over the clothes that were given to me from the White house. Well, I was born in the country. We were on a farm and my daddy was a sharecropper. It was really hard and we were there and there were split school sessions. The Black children went to school when it was convenient, when we didn’t have to go to the field and that bothered me greatly because the school bus would run and the White children would be on the bus. And my father was very submissive to White people and I saw people as people and I couldn’t understand why we, as little Black children, couldn’t go to school when the White children went to school. So, one day unbeknown to my father, I sneaked and I waved the plantation owner or the person who was supervising down, and asked him why we couldn’t go to school. He told me because we were picking cotton. Well, that didn’t make me feel well. [The man] told my father that he needed to train that little girl, because she had just gotten out of her place. So my father was rather upset, you know that, at that time it was seven children, or eight , where am I going to go with all these children. She’s just blew her mouth up. He always told me that I couldn’t talk up to White people, like I did. And I wanted to know why. So, he finally told me one day. He said, “Girl, they don’t care anything about us. They’ll kill us.” I’m like, Oh, my God. That bothered me. I can’t go to school, I can’t talk to White people. Then I may cause my family to lose their lives. That really, really, really bothered me. And I thought, one day, I will go to school. And one day, I will get out of this cotton field. I talked to my mother about it, she said, “Well, sometimes we have to just have to pray about what we think about stuff we can’t change. We have to pray about it.” I said, “How do I pray,” and she said, “You just be serious and ask the Lord to have mercy and guide us out of this torment that we live in every day and he’ll hear your prayer.” I guess I was the prayingest chil in the world because I’m the oldest and I kind of felt like the caregiver, the protector. Not only for my siblings, I kind of felt like I was the caregiver for my parents. I thought I could think better than they could, especially when they were being so submissive to this person who was so evil. Being a child, I guess I didn’t really understand, I’m not sure I ever wanted to understand that. But I did understand well enough, to not speak everything that I thought. That was not the only time I stopped the man. I stopped him again. I had finished picking cotton and we didn’t have any shoes and I stopped the plantation owner, or the person that was supervising, and asked him could he give my daddy some money so he could buy us some shoes ’cause we wanted to go to school. He told my daddy, “I told you to talk to that little girl. Now she askin’ for the money. She wants shoes to go to school.” Well, at least my daddy spoke up and said, “Well, yessir, they do need some shoes. They not doin’ anything and they could be goin’ to school now if I could get the money.” That just did something to me, because I felt like he was belittling my daddy, you know, not looking at him as a man, who was the head of his family. He was down-talking to my daddy. My daddy had a friend. My daddy told him about me stopping the man. This friend of his told my daddy to take a chance, leave the plantation, and buy his own land. The man had to almost lead my daddy by the hand to get him to do that. He told him, “Your children are working. They’re working like slaves for the White man. C’mon and buy your land and let them work for you and for themselves.” So he did. He bought the land. Then we had a house, we had running water and we went to school. Sometimes we were a little late going to school, but we went to school and I felt like that was a great move on my daddy’s part to get us off that plantation. So, I think of my childhood, that was the greatest move that was made in my life, because after that I felt like, I don’t know, I felt like somebody. I felt like I had a voice in this world.